Originally published under the title, "Turkey: "Home of Bad Jokes." Turkish Islamists are demanding the right to hold religious services in Hagia Sophia, a sixth century Byzantine church in Istanbul. In 2014, a group of marketing gurus produced impressive visual material that became Turkey's public relations (PR) face across the globe. The campaign, aiming to make Turkey one of the world's top five tourist destinations by 2023, danced around the slogan "Home of..." "Home of Coffee," one poster said. "Home of Trade," said another. The list included "Home of Troy," "Home of Ancient Gods" and "Home of the Iliad," too. But not just that. According to the PR campaign, Turkey was also "Home of Virgin Mary" and "Home of Christianity." The latter two sufficed to make Turkey "Home of Bad Jokes." The Hagia Sophia, for us, is not just a prayer house; it symbolizes, together with the Conqueror's (Sultan Mehmed II) heritage, our independence... Without it being opened to (Muslims) prayers, there is no way we, the Turkish nation, can be fully independent. The story of Hagia Sophia is a sad one. Its Christian builders could never imagine that the country that would host it centuries later would never feel "independent" unless it was converted into a mosque. Turkey has no shortage of mosques - there are more per capita than in Iran's Islamic Republic. 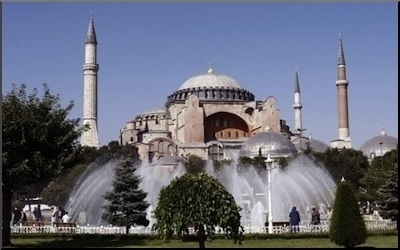 The Hagia Sophia Church was originally built in 537 in the Byzantine capital Constantinople. Until the fall of the city to Ottoman Turks in 1453 it served as an Eastern Orthodox cathedral and seat of the Orthodox Patriarchate, except between 1204 and 1261 when the Latin Empire converted it to a Roman Catholic church. In 1453, Mehmed II ordered the cathedral to be converted into a mosque. The bells, altars, iconostasis, sacrificial vessels and other relics were removed from the holy building. Mosaics depicting Jesus, Mother Mary and Christian saints and angels were removed or plastered over; and Islamic features were added to the Orthodox-Roman Catholic-and now Muslim prayer house. In 1935, the Orthodox-Roman Catholic-Muslim prayer house was turned into a museum. Since then Turkey's pious Muslims have launched numerous campaigns to open the unfortunate "Orthodox-Catholic-then Orthodox again-Muslim prayer house-and now a museum" to Muslim prayers again. The Hagia Sophia, in fact, has a namesake in the Black Sea province of Trabzon (originally "Trapezounta" in Greek). Built by Manuel I between 1238 and 1263, it had been converted to a mosque after Mehmed II conquered the city in 1461. Its frescos were covered in whitewash. In 1964, the church-mosque was turned into a museum, only to be converted into a mosque once again in 2012. But this did not satisfy the local Muslim congregation. Conservative newspapers complained that, "Muslims are being forced to pray 'in a mosque' in front of 'Christian icons and fresco.'" Muslims were demanding the lifting of restrictions on the destruction of such historical objects at their "mosque." No one even asked why there were Christian objects at a mosque. Protestors gather outside of Hagia Sophia on May 24 to demand its conversion into a mosque. In April, the top Muslim official in Ankara said that Pope Francis's labeling of the mass killings of the Ottoman Armenians as "the first genocide of the 20th century" would only accelerate the reopening of Hagia Sophia to Muslim worship. Professor Mefail Hizli, the mufti of Ankara, said: "Frankly, I believe that the pope's remarks will only accelerate the process for Hagia Sophia to be re-opened for [Muslim] worship." More recently, a large rally in Istanbul demanded that the Turkish government convert the Hagia Sophia into a mosque. The rally was led by the Humanitarian Relief Foundation (IHH), the organizers of the Gaza-bound Mavi Marmara flotilla raided by Israeli forces in May 2010. At the rally, protesters carried signs that said, "Hagia Sophia needs to be reopened as a mosque" and "Let our lives be sacrificed for Islam." The Turks physically conquered Istanbul in 1453, but Islamists apparently think the conquest is incomplete. Shortly before the rally, Turkey's Religious Affairs Directorate launched the exhibition "Love of Prophet" as part of a weeklong event dedicated to the commemoration of the birth of the Islamic Prophet, Muhammad. It was at this exhibition that the Hagia Sophia Church saw its first Quran recitation under its roof in 85 years. Turkey has no shortage of mosques. On the contrary, devout Turks enjoy the comfort of more mosques per 1,000 population than Sharia state Iran. The campaigns for the "Hagia Sophia Mosque" have nothing to do with a shortage of Muslim prayer houses in Turkey's most populous city. They merely reflect an Islamic crusader mindset. The Turks physically "conquered" Istanbul back in 1453, but pious Turks apparently think the conquest is incomplete with "Christian heritage" around. If the "conquest" is to be complete, all traces of "Christian heritage" must be wiped out. It is the same mindset that convinces Turks that Jerusalem, first built about 10 centuries before the birth of Islam, is a sacred Islamic city. With the possible reopening of the Hagia Sophia to Muslim prayers, Turkish Islamists will feel victorious. They will have conquered another holy edifice of Christianity. Then, at the Hagia Sophia mosque, they will gather to pray for the "liberation" of the "holy Muslim city" of Jerusalem.